Valentine's Day, February 14, 2013 was the gala opening of the NewtownHealing Art Space. Located in Newtown, CT an empty storefront donated by Brause Realty has become home. Managed by Newtown Cultural Arts Commission (NCAC), and supported by the Cultural Alliance of Western Connecticut and the Connecticut Office of the Arts (COA), HealingNewtown was created to facilitate, support, and coordinate arts-focused efforts made on behalf of Sandy Hook and Newtown now and into the future. The Healing Newtown space is being used to hold workshops, benefits, performances, art projects, and is open for those who would like to stop by. Some of the art donations at the opening will be permanent, others will part of a rotating exhibit. 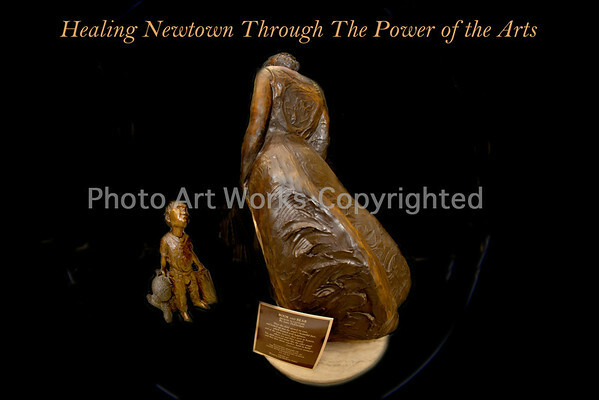 The Newtown Cultural Arts Commission spearheaded by Chairman Jennifer Johnson managed the project. She said, "today marks the two month anniversary since the tragedy. That's why at a difficult time like this it is so important for us to realize the magnitude of the arts, and how people, especially children, express themselves through the arts." Dignitaries included the First Selectman of Newtown, Pat Llordra, Newtown State Representives DebraLee Hovey, and Mitch Bolinsky, Governor of Connecticut Dannel P. Malloy, First Lady Cathy Malloy, and Connecticut's Lieutenant Governor, Nancy Wyman. Several artists with work on display came from near and as far away as Chicago and Florida. Also in attendance were members of Ben's Bells from Tucson, Arizona, Li Liu of Cirque du Jour, a Bejiing born acrobat, the Newtown Juggling $ Circus Arts Club, the Yale Whiffenpoofs an a capella musical group, students from Newtown Center for Classical Ballet performed with the Newtown's Children Choir and Singer/Songwriter Jim Allyn, Editorial Staff of ArtScope Magazine, a jazz trio from WestConn, and many others. Sales proceeds will be donated to the HealingNewtown Arts Support Fund less shipping and ECommerce fee.